Our world is moving at a fast pace where new technology is a constant instead of a novelty. Some are hesitant to embrace technology and changes offered to students in education, citing concerns stated in books like The Shallows: What the Internet is Doing to our Brains by Nicholas Carr. Concerns definitely to ponder as we thoughtfully embrace our changing and fast paced world. In his book, Carr builds a case for the printed book as promoter of deep and creative thought, while the speed and efficiency of the internet promotes production and consumption; the later encouraging loss of capacity for concentration, contemplation and reflection. For myself as an educator and parent, initially in the 1990s, I was hesitant to learn technology with the non-stop demands on a teacher. I felt this was "adding" to my already full day. Now though, I'm embracing technology for my students as fast as I can learn it, seeing it as an engaging way to capture their interests. This is partly in response to keeping up to my own children and students who seem automatically comfortable with exploring and using technology, and partly my own discovery of learning how to do things more efficiently. I'm finding learning new technology fun! I like the process of publishing a newsletter, blog, word document, brochure, writing an e-book, or making a video or stop-motion movie. These are just a few options of how students can creatively demonstrate what they are learning and produce a product they are both proud of and fits into their individual learning style. I like that technology offers a variety of choices to students with quick editing options so students can be thoughtful about their learning and easily make changes as they discuss and present their work to others. Their work does promote deep thought and creativity as they edit and use a new technology tool to produce their final product! I wonder what it is that makes some hold back in fear of change, stating caution and safety as their reasons, while others step out and move, ready to try something new; ready to lead. When Apple came out with their new e textbook options for the iPad, I and some others were excited, ready to move and try it! While some teachers claimed caution and that we need to move slowly (if at all) in this new direction as it may be harmful to our students deeper thinking. The cautious people encourage the risk-takers to be thoughtful; this is good! Now we can't imagine a world without paper books nor one where we were still reading from scrolls! We all resist some changes in our lives of some sort; I think that is human nature. But often, when we do make a change and it turns out for the better or makes an improvement in the quality of our lives, we wonder why we didn't do it sooner! If it does not work out for the better, we can always go back to the way it was done before - or at the very least, learn from the experience. 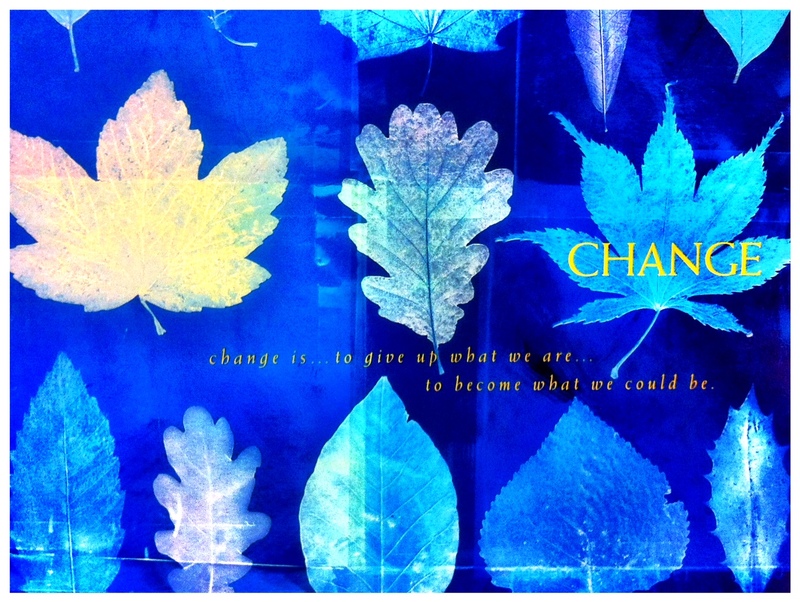 I'm suggesting that we embrace change thoughtfully and boldly! Let's step out of our comfort zone and try new technology to keep up with our changing world; to keep up with our students. As educators and parents, we are preparing our students for future jobs that we can't even imagine. We need to be involved in the shaping of the 21st Century Digital Learning for and with our children. They will need to be able to step out, adapt and change. Sometimes, it takes just one person to step out and lead a movement of change for the better. Sometimes, we need to step back and re-evaluate what works best. We can only find out if we step out and embrace change, thoughtfully.